For a free week of workouts at BODI, click here and select the $35 1-week trial. Use THEFOXYKAT as the promo code in order to workout for free. Let me know if you need a workout buddy – I’d love to join you! Working out at BODI, I was introduced to the agility ladders. I do not believe that I had used these before at a gym or even when training for sports when I was younger. I felt like I had two left feet the first time I tried doing a drill. I couldn’t keep up to the others in my group and I was out of breath after the 30-60 second exercise. Thankfully with some practice I got better. I was able to keep up with the others, I didn’t trip as much (it still happens- lol! ), and I was as out of breath at the end of the drill. 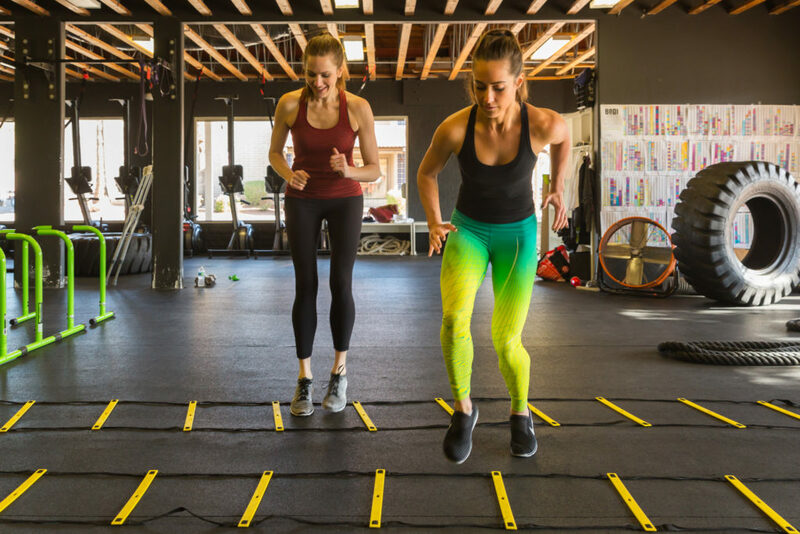 So, what’s the big deal about agility ladders and should you include them in your workouts? Agility training through ladders is fun! If you can laugh at yourself a little as you’re starting out, it will be fun for you to practice the different drills. Plus, you can incorporate the drills with a group of people rather than doing it by yourself. You can create relay races out of the drills and add a competitive vibe to your workout. Not to mention, the there is an endless amount of drills, so you will never get board or tired or doing the same thing over and over. Many athletes use agility drills and agility ladders to improve their feet speed. Improving your agility will help you to improve your ability to quickly change positions with controlled movements, which will give you an advantage over your competitors and essentially help your speed. Are Agility Ladders Easy to Use? 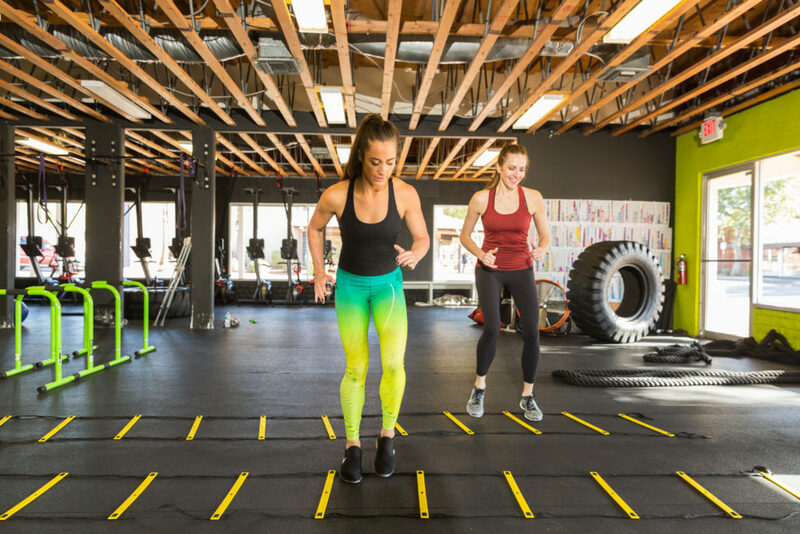 In a group – Agility ladders are fairly long, so depending on the drill you’re doing, you can typically get four or more people on a ladder to exercise together. If you’re new to agility ladders or feel the pressure about being slower than your exercise partners, what I always do is start towards the middle or end of the ladder. The first people who are typically faster will start at the first square. If you start towards the last squares, then you can quickly finish up the first exercise and run back to the beginning to start again. At home – Agility ladders are an inexpensive tool that is light weight and can folded and stored pretty much anywhere. Not to mention, you can put the agility ladder outside in the grass, on concrete or inside your home. Above all else, if speed is what you’re look for, don’t forget that your legs matter and they actually matter a little more than your feet. Lower body strength is a big impact to creating speed and agility. A quick first step is the result of a powerful first step and falls back on single-leg strength and stability as well. I found this great article from Peak Fitness by Mercola that can help you get started with a couple drills to do at home. Have you used agility ladders in your workouts before? If so, why do you love them or why not? I’d love to hear about your favorite drill below. Disclaimer: I am in no way a fitness expert, everything on TFK blog and specifically this blog post is written in my own opinion. If you are not sure if you should perform an exercise, please consult a physician. Amazing! Just lying of my sofa looking at that ladder made my knees and ankles hurt lol. I have not worked out since hurting my knee last August.